Use Transaction code FAGL_EHP4_T001B_COFI or navigate as mentioned in Period Lock under FI. Enter Pstng period variant and click the Continue button. You can assign a separate posting period variant to a ledger/company code combination. You can also control the opening and the closing of a period by ledger in this way. 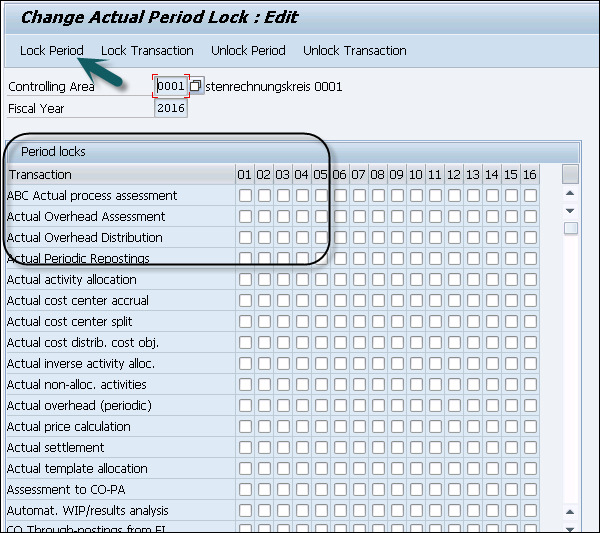 Step 1 − To perform opening/closing period under Controlling, use Transaction code OKP1. Step 2 − In the next window, you have to enter the Current Year in the Fiscal Year box and click the Actual button or press F5. Select a period that you want to lock and click the Lock Period. Step 3 − You can also Unlock Period, Lock Transaction, or Unlock Transaction.